She sent some Crystal Light for me to add to my water bottles. Believe it or not, I haven't had that before, so am anxious to try it. And, there were fruit snacks to munch on. Then, in the pampering department she sent some almond hand soap that smells just delish... almond is my absolute fave, so this one goes in MY bathroom so I don't have to share it with the boys! 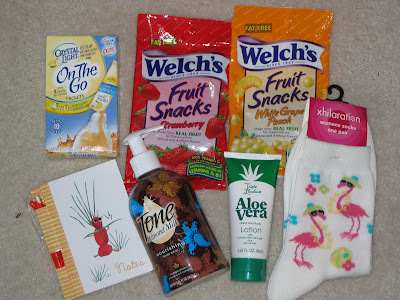 There's also a very nice hand cream, a cute little notebook with a pen attached, and some just-for-fun flamingo socks!! 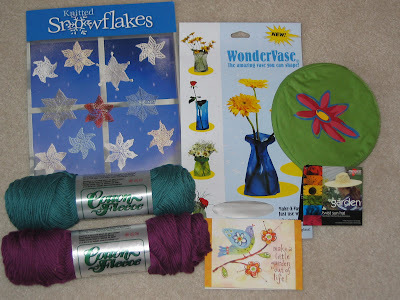 Next up is a pattern book for some adorable knitted snowflakes that look like great fun to knit. The yarn Wendy sent is GORGEOUS! It's Brown Sheep Cotton, which I've not had before, and it's soft and luverly. The colors are rich, and I just love that! The WonderVase is a piece of heavy plastic that you fill with warm water and shape to your liking. Then you change to cool water and add flowers! Inside that green "disc" with the flower on it is a sun hat! You take it out and give it a flip and it turns into a hat with a big brim. Then you twist it just right and it fits back into the little zippered pouch. The sun does unsightly things to my face, so it will come in handy! I'm hoping to attend a 'first' Yarn and Fiber Festival in a nearby city later this month, and this hat will go with me!! 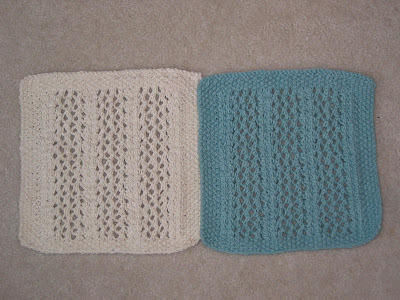 Wendy sent not one, but two, knitted dishcloths. The pattern is a very pretty one that I haven't seen before. She chose colors that are perfect for my kitchen! Thank you Wendy for everything!! You've been such a great pal, and I've enjoyed getting to know you! So glad that you are enjoying your package! It was a blast to put together for you. The snowflake pattern sounds really cool ( no pun intended). What a fun package you got. What adorable flamingo socks. Oooooh you lucky duck! The package looks wonderful. Love the dishcloth design! 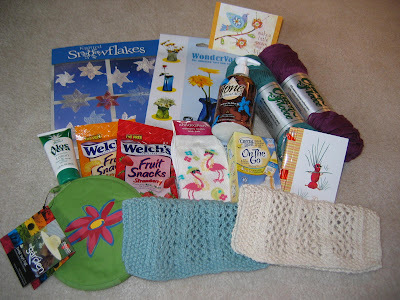 Great package! I swear by those on the go packets - must have in our house! Plus they're easy to keep in your car, purse, desk drawer, etc. So much cuteness to remark on, but the socks take the cake! What a fun package. 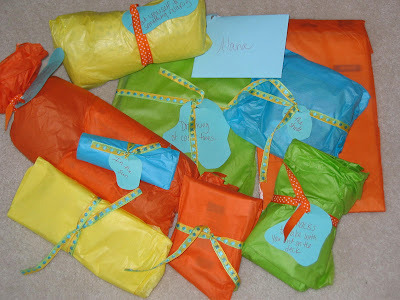 I know Wendy putting it together was a much fun as your unwrapping it. It would be for me. Looks like a great package. My mind must be on chocolate cuz I saw the lotion bottle and thought it was Dove chocolate in a pump. I know, weird thought.